It is estimated that approximately seven million divers are active worldwide and 500,000 new divers are training annually . Moreover, professional divers actively carry out diving operations for the purposes of commercial, scientific or military diving. The underwater environment is unique and any exposure to it presents a number of stresses to the human system. Levett DZ, Millar IL. Bubble-trouble: a review of diving physiology and disease. Postgrad Med J, 2008; 84:571-578. Hara H, Virmani R, Ladich E, Mackey-Bojack S, Titus J, Reisman M, Gray W, Nakamura M, Mooney M, Poulose A, Schwartz RS: Patent Foramen Ovale: Current Pathology, Pathophysiology, and Clinical Status. Journal of the American College of Cardiology 2005, 46(9):1768-1776. Vann RD, Butler FK, Mitchell SJ, Moon RE: Decompression illness. Lancet 2010, 377:153–164. Dunford RG, Vann RD, Gerth WA, et al. The incidence of venous gas emboli in recreational diving. Undersea Hyperb Med 2002; 29: 247–59. Spencer MP. Decompression limits for compressed air determined by ultrasonically detected bubbles. J Appl Physiol 1976; 40: 229–35. Wilmshurst PT, Ellis BG, Jenkins BS: Paradoxical gas embolism in a scuba diver with an atrial septal defect. Br Med J (Clin Res Ed) 1986, 293:1277. Torti SR, Billinger M, Schwerzmann M, et al. Risk of decompression illness among 230 divers in relation to the presence and size of patent foramen ovale. Eur Heart J 2004; 25:1014 –20. Hagan PT, Scholz DG, Edwards WD. Incidence and size of patent foramen ovale during the first 10 decades of life: an autopsy study of 965 normal hearts. Mayo Clin Proc 1984;59:17-20. Sykes and Clark: Patent foramen ovale and scuba diving: a practical guide for physicians on when to refer for screening. Extreme Physiology & Medicine 2013 2:10. The human body makes physiological responses to adapt to the environmental changes. Moreover, diving equipment, training, knowledge and skills also minimize stresses and increase safety while diving. In rare cases, certain hazards can occur to divers, such as nitrogen narcosis, oxygen toxicity and decompression illness (DCI). One risk factor that has been under research for approximately 30 years and statistically associated with DCI is the patent foramen ovale (PFO). The right side of the human heart contains venous blood with a low oxygen content, and the left side contains arterial blood, rich in oxygen and nutrients. In the unborn foetus, the lungs are not fully formed. In order for the foetus to constantly receive oxygenated blood, there is an opening in the wall between the two atria, the foramen ovale. The foramen ovale (Latin for oval hole) is a flap valve in the septum (the wall of the heart) separating the right and left atria. It is a one-way valve, allowing direct blood flow from the right upper chamber of the heart (right atrium) to the left upper chamber (left atrium). The foramen ovale allows oxygenated blood coming from the mother via the placenta to the right atrium and then directly to the left atrium of the foetus. The left atrium pumps the blood into the foetus circulation, providing the oxygen and nutrients required for growth and healthy development. At birth, when the baby begins to breathe, a flap valve closes over the opening in the atrial septum and starts sealing the opening. This fusion is complete by the age of two in about 75 percent of the individuals, while in the other 25 percent, the foramen ovale is not fully closed. The reasons the PFOs fail to close are unknown and the size of PFO in individuals varies, ranging from one to 19mm [2,8]. 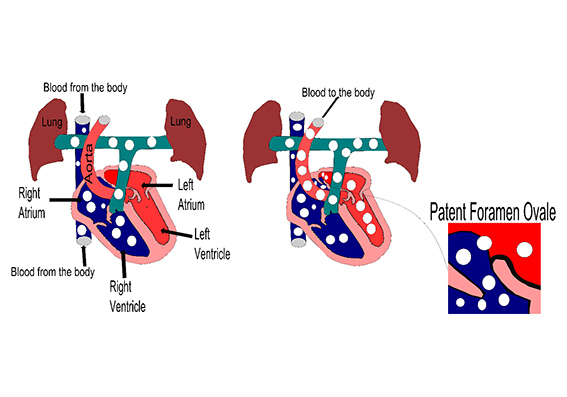 The persisting, “patent”, foramen ovale allows blood from the right atrium (blood from the veins) to move directly into the left atrium (blood from the lungs) and from there into the arterial circulation. Normally, this cardiac defect will cause no serious symptoms to those who have it because the pressure on the left atrium is always bigger than the right, which tends to keep the valve closed. However, this differential pressure is reversed while performing a Valsalva manoeuvre or while engaging in strenuous activities, e.g., lifting heavy dive gear and climbing into the boat . Hence, PFO poses a concern for divers as free inert gas forming in the body during decompression or after surfacing, bypass the vital lung filter and enter into the arterial circulation. Decompression illness is caused by bubbles in blood or tissue that are formed as a result of reduction in ambient pressure (decompression). The term includes both arterial gas embolism (AGE), in which alveolar gas or venous gas emboli (via cardiac shunts like patent foramen ovale or pulmonary vessels) are introduced into the arterial circulation, and decompression sickness (DCS), which is caused by in-situ bubble formation from dissolved inert gas . A patent foramen ovale is present in about 27 percent of the normal population, and theoretically, some venous gas emboli could enter the arterial circulation and even reach the central nervous system (CNS). It was first suggested in 1986 by Dr Wilmshurst and colleagues that a right-to-left cardiac shunt may be important for venus gas embolism (VGE) in scuba divers. They observed neurological decompression sickness in recreational scuba diver after a 15-minute dive to 38 metres, and attributed its cause to venous gas . Overall, the presence of a PFO is related to a low absolute risk of five major DCI events per 104 dives, the probability of which is five times as high as in divers without PFO. The risk of suffering a major DCI increases with the PFO size . However, the absolute risk of serious (neurological) decompression sickness is smaller than 0.02 percent. In addition, the patent foramen ovale is unlikely to be the triggering factor behind decompression sickness since a substantial amount of venous gas should be present, which is unlikely if the diver follows conservative depth-time profiles [4,5]. A procedure of closing the PFO is possible, and it is reasonable to expect that the closure could reduce the probability of DCI occurrence. Since an evidenced-based risk-benefit analysis does not still exist, the specific issue remains controversial . Closing a PFO contains some risks and has a complication rate of around two to five percent, while the risk of a DCS event in recreational diving is much lower—about 0.02-0.05 percent . Closure should only be performed after serious discussion and evaluation of the risks and benefits of such an operation. According to Dr Peter Germonpré from the Centre for Hyperbaric Medicine of the Military Hospital in Brussels, a systematic screening of PFO is not recommended since PFO is so common and DCI is so rare. Testing for a PFO is useful only in instances where there have been several DCI incidents of a type known to be PFO-associated. In short, having patent foramen ovale is not considered an absolute contraindication to diving by dive physicians. Patency of the foramen ovale is a risk factor for DCI and all divers should be aware of this. Dive training organizations should indicate the patent foramen ovale as a reason of caution. Dr Vann, Department of Anaesthesiology and Centre for Hyperbaric Medicine and Environmental Physiology, Duke University Medical Centre, points out that PFO is a common anomaly in the general population and many individuals that suffered from DCI did not have it. Therefore, there is not a causal link between patent foramen ovale and an individual case of decompression sickness . The primary cause of DCI is the inert gas bubbles, not the PFO. The editorial staff wish to thank Dr Neil Pollock of DAN for his assistance with this article.